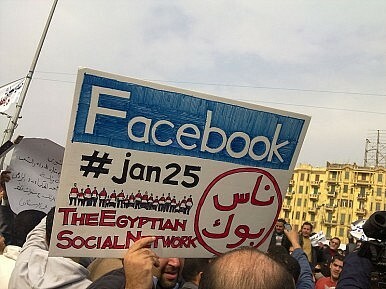 The protests in Cairo have had Southeast Asian netizens talking—and comparing events to unrest in their own countries. Unless you’re a hermit living in the boondocks, you’ll have heard something about the massive anti-government protests in Egypt that started late last month. The protesters have become global celebrities as they’ve taken a brave stand against the three-decades-old regime of President Hosni Mubarak. The ‘million-man march’ has also made Tahrir Square in Cairo a regular fixture on TV and computer screens across the globe. A mix of global attention and geo-political significance has prompted reaction and comment from around the world, including here in Southeast Asia. And, based on my monitoring of the online comments from this region, I’d say the responses can be grouped into four categories. First, there are the netizens who have been focused on declaring support for the struggle of the defiant protesters. They’re using the #egypt Twitter hash tag to express their solidarity with the protesters aiming to topple the Mubarak government. The majority of these commenters are also expressing hope that the protests will help usher in a democratic government in Egypt. The second, closely related, set of comments has focused on the pro-Mubarak thugs who appear to be sowing the seeds of violence in the streets of Cairo and elsewhere. In particular, they’ve been condemning the use of tear gas and guns to disperse the crowds. These commenters have also noted, with particular concern, the numerous reported attacks on journalists who are covering the crisis. Then there are those comments focusing on Egypt’s future. It seems that all of a sudden everybody on the web has become a political expert on Egypt and the Middle East. Still, most of them seem to agree that Mubarak’s political fate has already been sealed and that a transition government should be established soon. This isn’t a view shared by Malaysia’s former leader and now popular blogger Mahathir Mohamad, who himself was prime minister for more than two decades. He warns that political change isn’t always for the better. Finally, many netizens in Southeast Asia are relating the Egyptian protests to past revolts in their own countries. For example, Indonesians are comparing the rallies in Egypt to the 1998 student protests and riots in Jakarta that eventually led to the resignation of President Suharto, who ruled the country for three decades. Filipinos are describing the ‘revolution’ in Egypt as similar to the People Power Revolution in the Philippines in 1986 that toppled the Marcos dictatorship. Many Filipinos think that it’s more than a coincidence that the Egypt protests are happening during the 25th anniversary celebrations of this historic revolt. Thai citizens, meanwhile, are pointing out the similarities between the Egypt rallies and the anti-government Red Shirt protests last year in Bangkok. Remembering the past is a harmless habit as long as it remains a study of ‘dead’ history. But memories of past revolts can also inspire citizens to reflect on their situation today: Are they better off now? Have political and social conditions improved? Remembering the ‘radical’ past could actually trigger a desire in the hearts of many citizens to act in order to change what they see as the oppressive present. The protests in Egypt therefore dangle the prospect of a real political alternative to those who are tired of waiting for substantial reforms. This makes ‘Egypt’ a potentially subversive idea. ‘Egypt’ is now synonymous with revolution, and this is something that scares dictators of all stripes. This could well be the reason why Cambodian Prime Hun Sen has warned that he’ll take harsh measures against anyone who attempts to initiate anything ‘Tunisia-like’ or ‘Egypt-like’ in Cambodia.